War-torn Taiz governorate district of Al Qahira, Yemen. The United Nations Special Envoy for Yemen, Ismail Ould Cheikh Ahmed, has welcomed the start of the cessation of hostilities that began at midnight, 19 October, while the UN refugee agency took advantage of the pause in fighting to rush desperately needed aid to the embattled south-central city of Taiz. 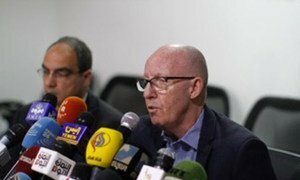 At the regular press briefing in Geneva, Adrian Edwards, the spokesperson for the Office of the UN High Commissioner for Refugees (UNHCR), announced that the agency is delivering emergency supplies to more than 125,000 people in Yemen, including those in Taiz, where fighting has been particularly severe. Since the beginning of the conflict in March 2015, humanitarian responders have been delivering aid to the country, but with great difficulty, as the fighting intensified. This ongoing aid delivery is not linked to the current cessation of hostilities. However, the agency welcomed the current pause, which will allow those in hard-to-reach conflict zones to receive assistance. UNHCR is delivering tarpaulins, sleeping mats, blankets, kitchen sets and buckets for hygiene and sanitation. There will also be shelter repair kits to support some 25,760 people. Mr. Edwards said UNHCR hoped the ceasefire would last long enough to lead to resumed peace talks and opportunities to deliver additional aid. “UNHCR has been advocating with parties to the conflict for regular, sustained and unimpeded humanitarian access to those most in need,” stated Mr. Edwards. “Humanitarian operations in Yemen are still constrained by the conflict, which has left 21.2 million people – more than 80 per cent of the population – in need of help,” he added. In addition to having reached some 12,309 people prior to the ceasefire, the UNHCR will deploy 21 convoys for Taiz and five other governorates – Ibb, Amanat Al Asimah, Amran, Hajjah, and Al Hudaydah – areas that are hosting 1.427 million people, or 65 per cent of Yemen’s 2.21 million displaced population.Yemen’s economy is devastated and the country has suffered severe infrastructure destruction. Many are in need of shelter as well as food and drinking water. Over-stretched local communities are hosting 62 per cent of those who have been displaced, where risky makeshift arrangements, such as public or abandoned buildings and informal settlements, offer shelter with little or no protection. Since the conflict began last year, 2.2 million people have been internally displaced, while 180,500 have fled to neighbouring countries. In addition to Yemeni nationals, there are 278,034 registered refugees and asylum seekers, primarily from Somalia and Ethiopia. Meanwhile, as Mr. Ould Cheikh Ahmed welcomed the cessation of hostilities, he urged all parties to work to ensure that the terms are fully respected. He noted that the cessation of hostilities is “fragile but largely holding” and that it underscores the improvement of the general security situation in Sana'a and several areas in Yemen, despite the reported cases of violations in other areas like Taiz and the borders with Saudi Arabia. According to a statement from his office, Mr. Ould Cheikh Ahmed urged the sides to show restraint, avoid further escalation, and strictly adhere to the 72-hour ceasefire. The statement said that the Special Envoy is liaising with the parties to agree on an extension for the duration of the truce to create a conducive environment for a long lasting peace in the country. He reminded all parties that the terms and conditions for the cessation of hostilities include commitments for the unhindered access for humanitarian supplies and personnel to all parts of Yemen. Following a month that saw civilians continuing to bear the brunt of the conflict in Yemen, a 72-hour halt to fighting set to take effect later today is welcome, but not nearly enough time, according to a senior United Nations relief official, who appealed for more predictable access to be able deliver aid to hard-to-reach communities caught up in the crisis.